In the week leading up to Cyclone Pam shrieking into Vanuatu, Fe’i Tevi remembers the signs of what was to come. “Bursts” of wind would whack into Port Vila, the capital city, every five or six hours, he recalls. Cyclone Pam was creeping towards Vanuatu, at three knots per hour, expected to hit Port Vila around midday Friday. As Pam crept closer, its ETA was rescheduled. First, to 6pm. Then, it was delayed again – the full force of the cyclone would hit between 10pm Friday and 1am Saturday. As Friday ground on, Fe’i – who had moved his family from Fiji to Vanuatu in January – noticed the winds change. In the early part of the day, those gusts were coming more frequently – every 30 minutes or so – and when they hit, they would drive the rain sideways. The gaps between gusts grew smaller and smaller. Every 10 mins, every five minutes – then, by 10 pm, every few seconds, like a steam train gathering speed – until the wind howled non-stop, between 115km to 150kmh. Punctuated by yet more fierce blasts. By midnight, Fe’i recalls, those blasts were clocking 250kmh, uprooting much that was in their path. 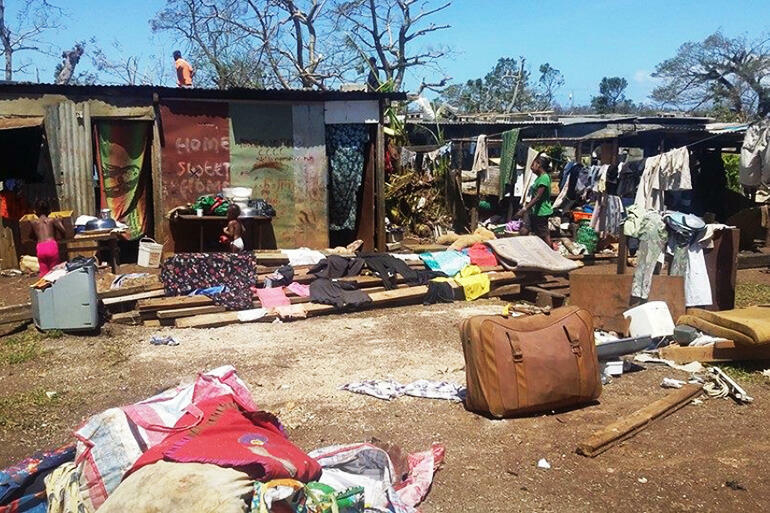 Fe’i, his wife Eleni and their five children sheltered in their Port Vila home, which is one house back from the edge of a lagoon. When Saturday dawned, they found a 25m coconut palm had draped itself across the concrete wall that divides Fe’i’s place from their neighbours. The cyclone had uprooted that palm from the edge of the lagoon, hurled it over their neighbour’s roof – just like a kilted athlete tosses the caber – and whanged it into the wall. If it weren’t for that wall, Fe’i reckons, the Tevi family might now have a very large pot plant in their living room. The neighbours who dodged that flying tree didn’t get away scot-free, however. Because at the height of the blast, they were sloshing around their living room, knee-deep in sea water. Since the Tevi family has been in Vanuatu, they’ve chosen to worship at the Seaside Anglican parish, which is in a poor part of town, near the coast. That church wasn’t flash – just a humble lean-to shelter, built about 12 years ago for worship, and community, with the idea being that as funds became available, that shelter would be replaced. Well, replacement is certainly the only option now. The Seaside parish church was flattened. Its timber were splintered, the sheets of roofing iron either torn, buckled or missing altogether. Fe’i has lived through a couple of mega-wrathful cyclones in Fiji. None though, he says, were as vengeful as Pam when it struck Vanuatu. And the destruction Pam wreaked is as you’ve seen on the TV news. That said, Fei’ feels a bit frustrated by the way the media are portraying the people of Vanuatu. It’s not that they don’t need help. But Fe’i’s not happy that they are being shown as dependent, helpless victims. “A disaster has happened, yes. “But people here are resilient. They will pick up their lives, and they will move on. “As of Saturday afternoon, and Sunday morning, they were already rebuilding their houses. “People in the Pacific are used to cyclones – though not as severe as this one. “If the help comes, good. Wonderful. We are thankful for that. Fe’i Tevi is a diplomat by training. He’s skilled in international relations. He’s also been called a “development entrepreneur” – but in Vanuatu, he’s a house husband. His wife Eleni is monitoring a European Union development grant there, and so he’s looking after their five kids. Fe’i is also a committed Anglican, who serves on the General Synod Standing Committee for the Diocese of Polynesia, and on the Social Justice Commission, the Way Forward Commission and on the group looking at ethical reinvestment. 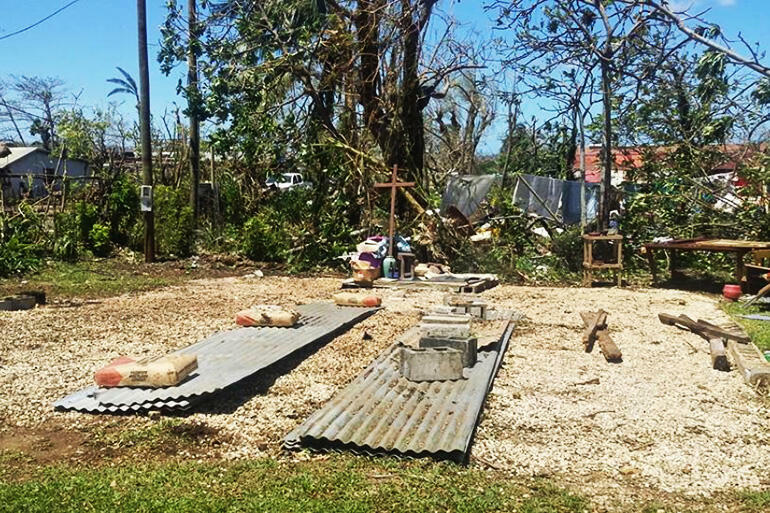 Fe’i also has a particular expertise in helping Pacific Island churches step up to the plate when natural disasters strike. He spent years, for example, serving the WCC’s Action By Churches Together programme, and he reckons he knows which way the wind is blowing for Pacific Island nations. And he’s convinced that the best long term help we can offer – such as the Anglican Missions Board is seeking to provide – is “to build resilience” in the churches. Fe’i explains: “It is a given fact,” he says, “that these extreme weather events will only increase. “We cannot take a piece-meal approach to these events. “And we cannot build resilience by attending to a case-by-case basis." One of the ways the church can get ready, he reckons, is by stockpiling. “You stockpile containers in each of the capitals,” he says. “In Vila, in Santos, and Banks and Torres. “We place two or three container in each of those three towns – and we stockpile them with enough supplies to cater for the immediate needs of the 500 or 100 families who will come through. “What do we put into the containers? Things like: water sanitizer capsules, tools to rebuild, tarpaulins, rice and flour. These are the things people need, straight away. So that when disaster strikes, you have that stuff on hand. “We also need to build the capacity of the priests and pastors to be able to respond and take care of the people when disasters strike. And DRM is exactly what Fe’i and his Port Vila parish priest are practising right now. Together, they’re going around each of the homes of families in the parish, taking photos, building up a first-hand assessment of their needs. When they’re done with that, they’ll send that illustrated report to the Diocesan office in Santos, so they too will understand the needs of the Seaside Parish family. Cyclone Pam has veered away from Vanuatu now, of course. But there’s another potential disaster looming, Fe’i reckons. “What people in Vanuatu and Island communities do after disasters,” he says, “is eat whatever is available. “They will uproot the plants, and eat whatever is in the ground. “This will keep them going for around two to four weeks. “And the actual disaster – in terms of food shortages – will only hit Vanuatu maybe three weeks from now. “Because the purchasing power of the Vanuatu people is very low. They will not be able to go into the supermarkets. They will struggle – because their staple foods like bele and taro and manioc will have run out. One way to head off those disasters, says Fe’i, is to begin planting. Now. And tide people over until life is back to normal. Somewhere near back to normal, anyway.